Schoen, Harold, Ziebarth, Steven W., Hirsch, Christian R.
A volume in Research in Mathematics Education Series Editor Barbara J. Dougherty, Iowa State University The study reported in this volume adds to the growing body of evaluation studies that focus on the use of NSF-funded Standards-based high school mathematics curricula. Most previous evaluations have studied the impact of field-test versions of a curriculum. Since these innovative curricula were so new at the time of many of these studies, students and teachers were relative novices in their use. These earlier studies were mainly one year or less in duration. Students in the comparison groups were typically from schools in which some classes used a Standards-based curriculum and other classes used a conventional curriculum, rather than using the Standards-based curriculum with all students as curriculum developers intended. This volume reports one of the first studies of the efficacy of Standards-based mathematics curricula with all of the following characteristics: · The study focused on fairly stable implementations of a first-edition Standards-based high school mathematics curriculum that was used by all students in each of three schools. · It involved students who experienced up to seven years of Standards-based mathematics curricula and instruction in middle school and high school. · It monitored students’ mathematical achievement, beliefs, and attitudes for four years of high school and one year after graduation. Prior to the study, many of the teachers had one or more years of experience teaching the Standards-based curriculum and/or professional development focusing on how to implement the curriculum well. · In the study, variations in levels of implementation of the curriculum are described and related to student outcomes and teacher behavior variables. Item data and all unpublished testing instruments from this study are available at www.wmich.edu/ cpmp/evaluation.html for use as a baseline of instruments and data for future curriculum evaluators or Core-Plus Mathematics users who may wish to compare results of new groups of students to those in the present study on common tests or surveys. 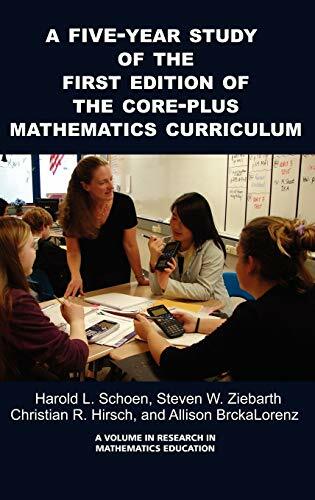 Taken together, this volume, the supplement at the CPMP Web site, and the first edition Core-Plus Mathematics curriculum materials (samples of which are also available at the Web site) serve as a fairly complete description of the nature and impact of an exemplar of first edition NSF-funded Standards-based high school mathematics curricula as it existed and was implemented with all students in three schools around the turn of the 21st century.